This novella is dedicated to the memory of Rod Serling (writer and creator of The Twilight Zone), and it shows. 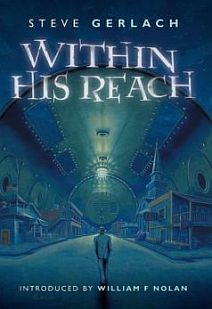 Within His Reach is a quaint little story that harkens back to the film-noir days of the 1950s where American towns were a picturesque realm of suited, cynical attitudes with a black and white visual style. But underlying this hardboiled world’s glossy surface is also the propaganda beneath: that what lies on top is merely an illusion our authorities want us to believe in …At this time in history, polio is an epidemic sweeping the nation, and Arnold Enright is one of the poor unfortunates to lose everything he holds dear to a disease that relegates you to the mechanical prison of living in an iron lung. Told in first person narration, this is where the story picks up, and Gerlach does a good job conveying the despondency of the disease. When Arnold decides to go ahead with radical surgery and subsequently wakes up in his home town of Hope Springs a whole man, his elation soon turns to despair when he realizes that the town is empty and everything has the drab quality of a nightmare. Was the surgery a success? Is he merely dreaming? Why does everything he touch vanish into non-existence? Despite the world around him falling apart yet again, Arnold goes in search of the wife who abandoned him and the daughter he’s never met.Here, Steve Gerlach has given himself the task of translating the The Twilight Zone ambiance into a literary format, and for the most part, he succeeds; reading, we can almost hear the show’s soundtrack in the background – can almost anticipate an intermission when events fracture into pure slippage. But I also had the feeling this is a short story that has been stretched like taffy into the length of a novella. As I whole, I think it could have benefited from being sluiced down to half the word count … and made an enjoyable read even more palatable to fans of science fiction noir. A small quibble in an otherwise engaging story.The Australian small Press Tasmaniac Publications have done a beautiful job with this edition, and although copies might still be available elsewhere, it seems to have sold out in its current incarnation. Tasmaniac have a reputation for glossy, imaginative illustrations and covers, and Within His Reach is no exception. It also contains a nostalgic and original foreword by legendary writer William F. Nolan entitled The Twilight Years.